Another day, another birthday. December is just about the craziest month in my calendar. This month Mr B and I celebrate our wedding anniversary, Emi and Mr B have their birthdays and then there's Christmas. I seem to lurch from one event to the next, never properly prepared for any of them. And today is Mr B's birthday. He's going to celebrate tonight with one of his favourite roast dinners followed by birthday brownies and ice cream. It may not sound desperately sophisticated, but I can think of few things that beat the unctuous pleasure of gooey chocolate brownies with the cold deliciousness of rich vanilla ice-cream. Ideally I'd serve the brownies still warm from the oven and oozing dark chocolate, but we'll see how my timing goes as I've got a mountain of other things to get crammed in today. 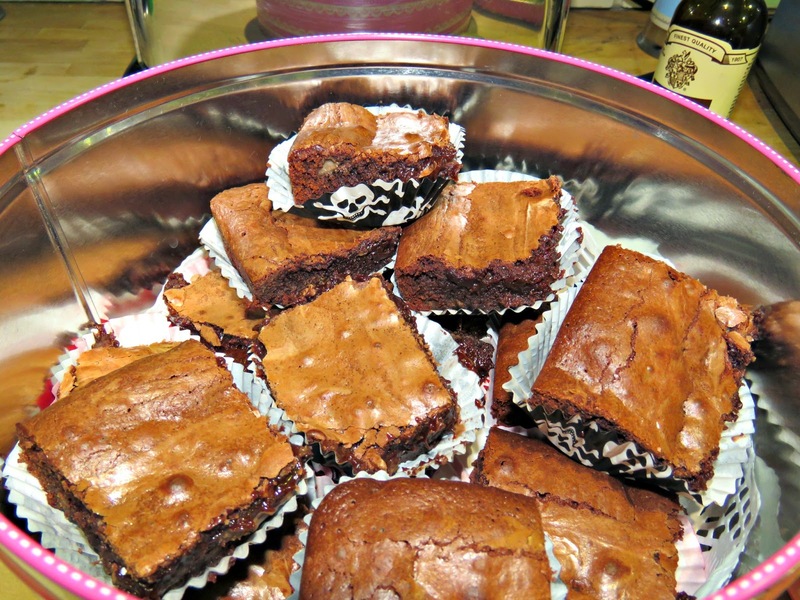 As I've mentioned before these brownies are the perfect birthday party alternative to a birthday cake. All you need is a big pile of them neatly jacketed in cupcake papers and you're ready to go. I always get in a muddle trying to cut up one of those classical, circular cakes so that each of twenty hungry nine year-olds can have a roughly equal slice. 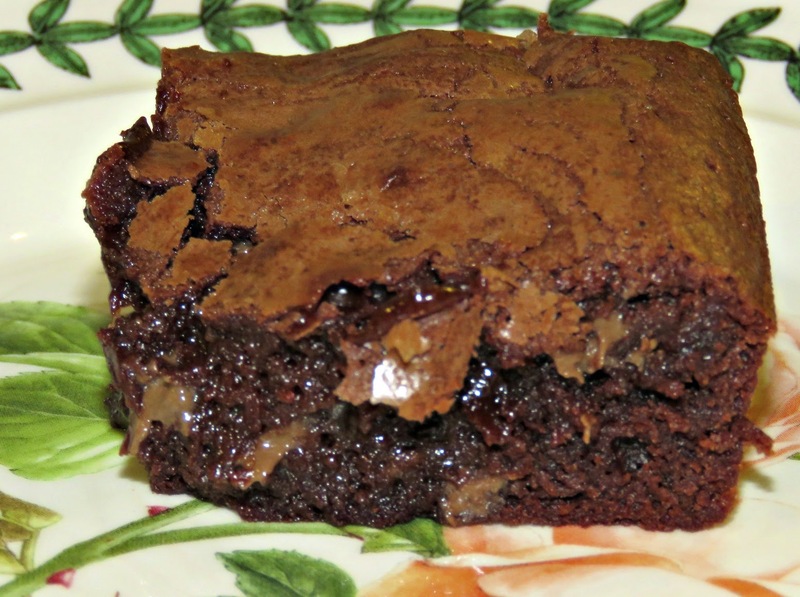 It's so much easier to just produce a large pile of pick-one-up-and-go brownies. Today I'm making a small batch as there will only be the four of us at tonight's celebrations - and the Wonder Dog is not allowed chocolate. This recipe will produce 16 brownies. 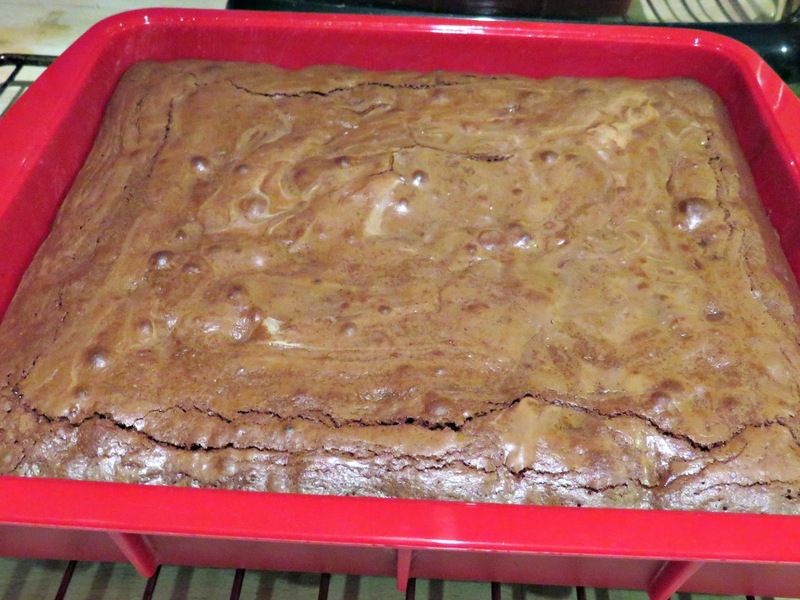 I use a wibbly wobbly silicon baking tin that measures 20 cm x 23 cm and comes with marked lines for cutting equally sized brownies. I've got a couple of these, which I use to bake cakes as well. 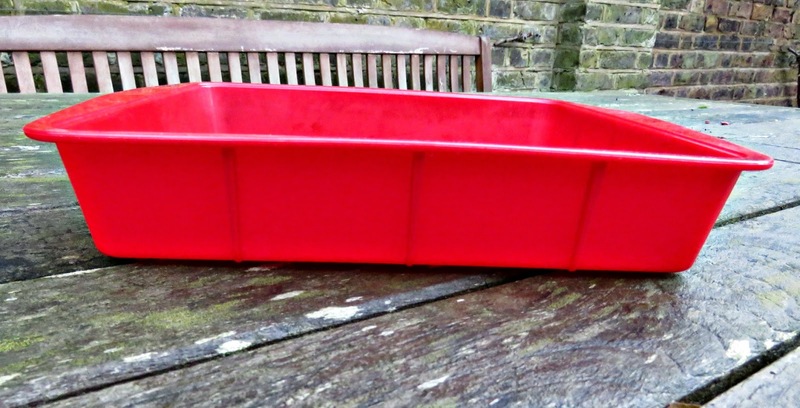 They were the first silicon baking trays that I bought. At first I was very nervous about using them, but now I think they're brilliant. The cakes never stick and they're really easy to get out when you're done. 1. 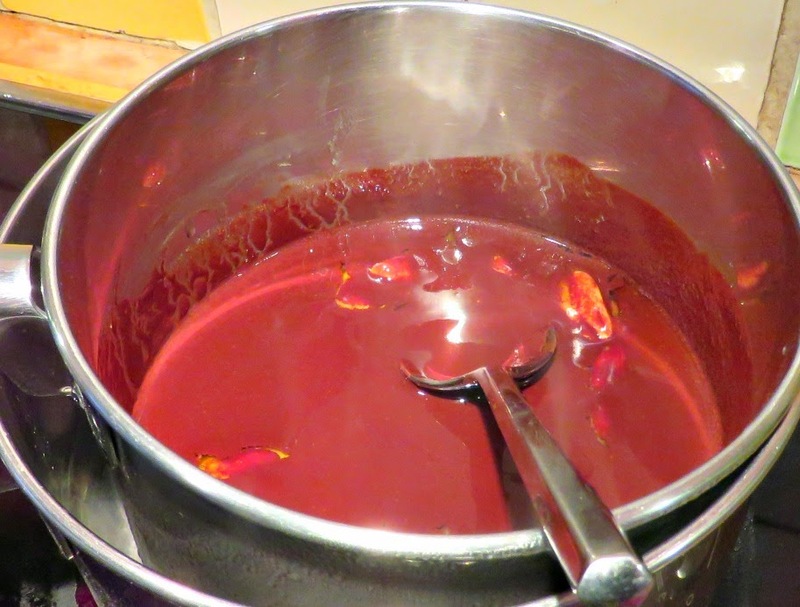 Preheat the oven to 180º C/ 360º F.
2.Melt the chocolate and butter together. 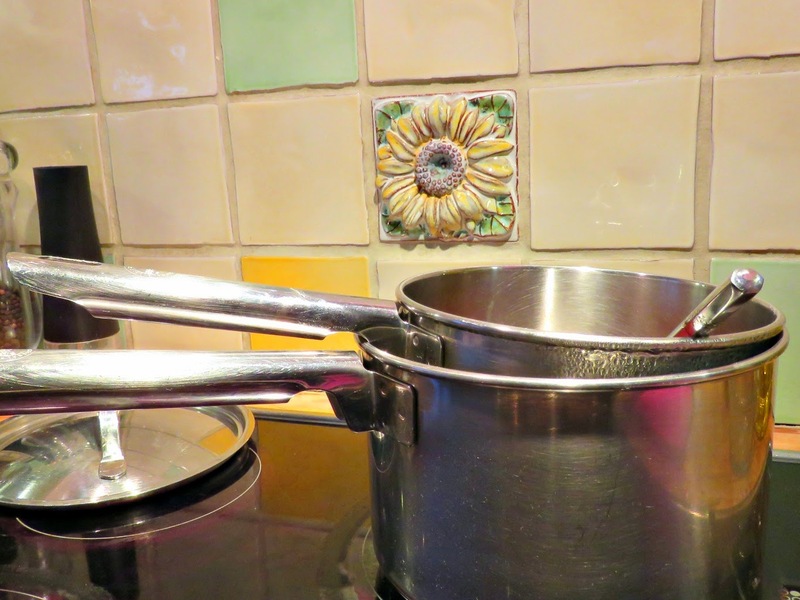 I do this with two saucepans, one slightly bigger than the other. Put some water in the larger saucepan and bring to the boil. When it starts to steam put the butter and chocolate in the smaller saucepan and place it in the larger one so that they melt from the heat of the steam. This way you get enough heat to do the job, but not enough to burn the chocolate.You should melt them to get a uniform velvety mixture. 2. Beat the eggs with the sugar and vanilla essence. 3. Allow the chocolate/ butter mixture to cool a little for a few minutes and then add to the eggs/ sugar and vanilla mixture. If you add them too hot you risk a scrambled egg effect, which is not good. Fold in the flour and beat until the mixture has a uniform consistency. Add the chocolate chips and stir through. 4. Place the mixture in a greased baking tray that measures approximately 20 cm x 23 cm (8" x 9") and bake in the oven for about 25 minutes until it firms up on top and dries out to a slightly speckled appearance. 5. Cut into squares and enjoy with a nice cup of coffee or some ice cream if you want to be really indulgent. Store in an air-tight tin, although in our house they don't get to rest for very long in storage. Happy wedding anniversary to you and Mr B, and happy birthday to him! 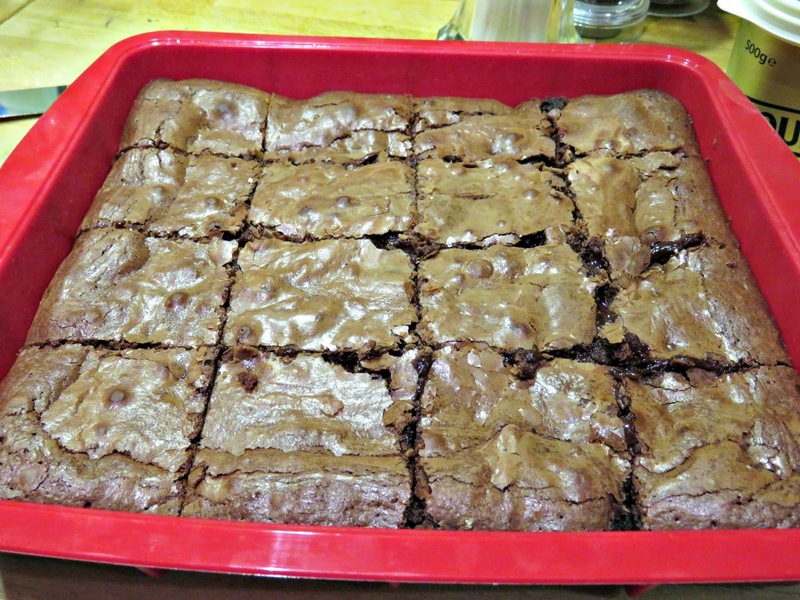 I discovered brownies only in 2001, when I moved to the USA. YUMMY! I always add tons of nuts in mine, as both Zeno and I love any kind of nuts known to men. ;) I must say I've never heard of bake-stable chocolate chips? I will have to ask Dr Google. Happy Tue to you.